"Early cattle and hog farmers wanted a herding dog which demonstrated more toughness and aggression for their not-so-meek stock. (This type supplied the herd owner with a guardian as well.) To create these dogs, herding breeds were crossed with mastiff or flock guard types. This often produced a drop ear (which may be cropped to stand) and a dog with a more robust, muscular build. It also left the tell-tale rear dew-claws, a distinguishing feature of the flock guard/mastiff dogs for many thousands of years. These dogs are often called 'shepherd' instead of 'Sheepdog." 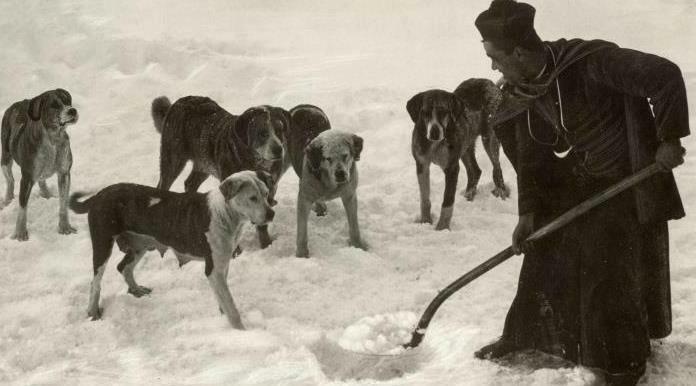 "Hunting, however, was never this Hungarian working dog's primary funtion. In Hungary, the Kuvasz is the formost guardian of flocks. Its size and strength, which were advantages in its boar-battling days, were equally applicable to its role as flock guardian." The Lockhart line of Old White English, the Cane Courso, and the Puerto Rican Sporting Mastiff are all known for their "tell-tale rear dew-claws"..
"Some link the high incidence of rear dew claws in the breed to the old Spanish fighting breeds of mastiff type." "We also find another breed closely resembling the Spanish mastiff existing in the Alps, and owing to the similarity in type, there is every reason for believing the old Alpine mastiff was identical with the Alan, and probably derived from Spain...The dog resembles a vast white mastiff, with stop well defined, but somewhat longer in head than the English variety should be." "The Spanish guard dogs were known to walk straying sheep gently back to the fold, but they were protecting animals they viewed as their own kin. It is difficult to imagine that a dog trained to maim and kill Indians would be able to exercise such judgment." "In modern times, the high, curled tail is seen in few of the herding dogs. In fact, many of this group's breed standards specifically mention it as a fault, to eliminate any throwback genes. Most carry their long tails low, and, as a signature of their ancestors, they curve at the end like a shepherd's crook." "You're seeing too many big dogs being advertised today weighing 75-80, anywhere up to 100 pounds. They are just not the real McCoy." Least we forget, these larger dogs were once the common size found fighting bear in the Pits/Arenas of Bordeaux, as they were in England, perhaps not as a Pure Breed, but they exisisted none-the-less, and it was crosses of these with Terriers that the story was told of the APBT,..
"The barbaric pratice of pitting dogs against bulls, bears and other dogs was just as popular in France as in medieval England. The Douge de Bordeaux was reguarded as a multi-purpose animal. In the Pyreenes and South of France, one authority tells us, 'It was kept to protect herds of cattle against the depredations of wolves and bears, and accompanied sportsmen on boar and bear hunting expeditions. 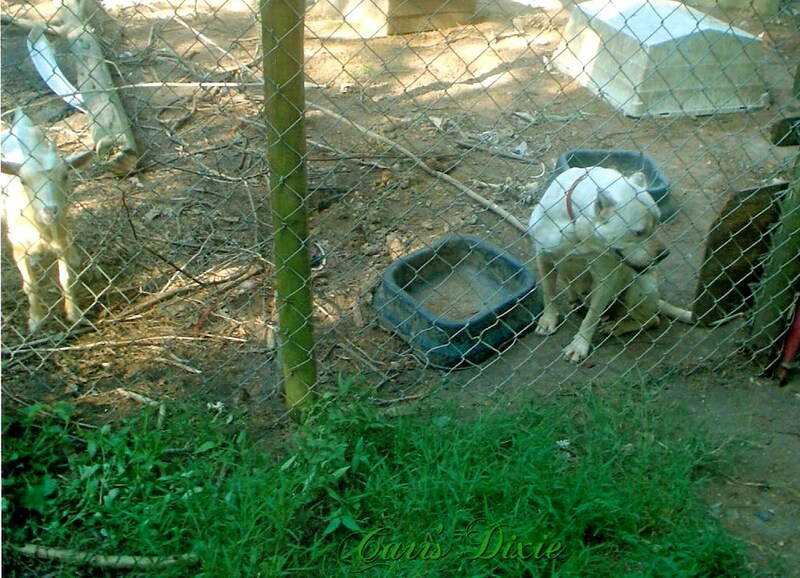 Spanish mercenaries took many of these dogs with them in the war against Mexico.' If this information is correct, it would certainly appear that the Douge de Bordeaux actually arrived on the North American continent much earlier than is generally conceeded." "During the European Renaissance, the Great Butcher Dog was common. This more placid mastiff helped drive cattle to market, guarding the livestock as well as the owners, and often carrying the sales money home around his neck!" "For many years, the term 'pit bull' was given to any dog of the fighting pits. The United Kennel Club originally registered these breeds of dogs and, at one time, regulated dog-fighting." "Bill Hines of Harlingen , Texas, uses his American Bulldogs as hog-dogs, in the classic medieval catch-dog manner, with all his stock being from old working lines." One of these "old working lines" was the Carr White English, as seen on his video, the dog with two red eye patches running behind a truck (to show endurance). However, this "old working line" is still used to guard farms and livestock, including mine. (See photos below, the Grandson and Grandaughter of Rad's Max-A-Million on Billy Hines video). state. These dogs were known at that time as 'White English,' in reference to their origin." "The Spanish still have the word in use under the Spanish form Alano, and curiously enough showing the close relationship between the two breeds, apply it to denote either a mastiff or a bulldog." "Great working dogs are bred from because they work, which proves that they are workable. Such dogs would transmit to their progeny the same ability to work even if they had never been used for work; but only the actual work they do, proves their ability to work and enables breeders to know that they can work." 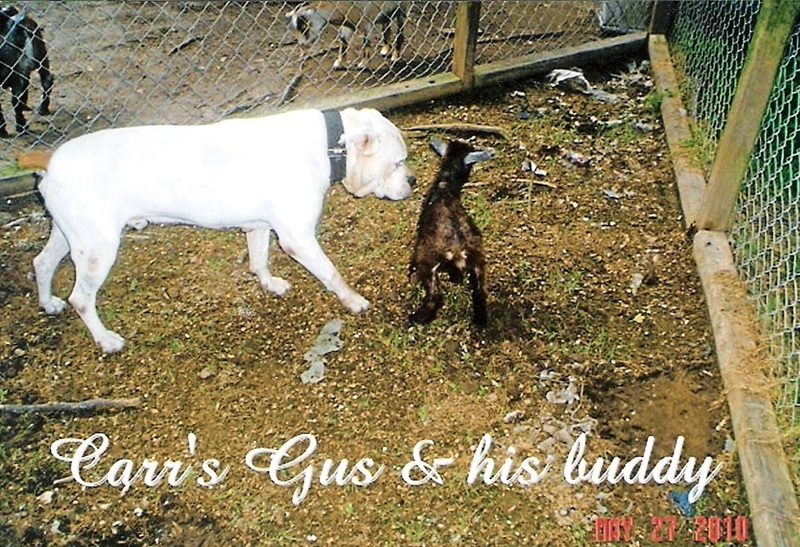 Since I use my Bulldogs to guard my goats - they are tested for "...protection dogs, for their chickens and their stock, their families and what have you."